This section features Non-Florida Marvel merchandise. Click here to see Marvel products with a Florida namedrop. This section features non-Florida Marvel merchandise. 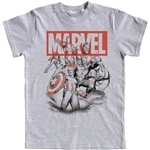 Click here to see Marvel products with a Florida namedrop.